Organic light-emitting device (OLED) is a solid-state light-emitting device based on organic semiconductors. Recent rapid advances in material chemistry have enabled white OLEDs to be used for general lighting and large-area flat panel displays. 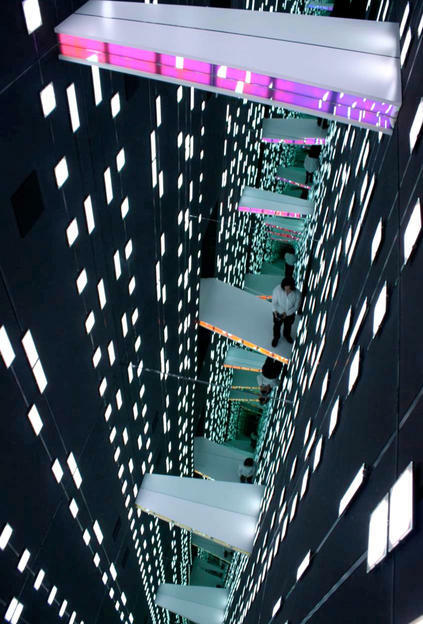 Efficacy of white OLED panel has reached 110 lm/W which exceeds that of fluorescent lamp, and white OLED panels having tandem structures have realized operational lifetime of over 100,000 hrs at 1,000 cd m–2 (ref. 1,2). 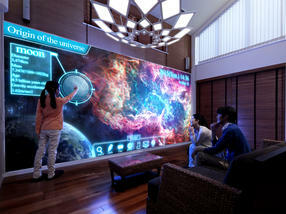 Recently, large-size 77’’-inch OLED TV based on white OLED has been demonstrated. Furthermore, OLED panels can be fabricated from organic semicon­ductor inks by solution-processes such as inkjet printing and gravure printing techniques thus enabling printable electronics. What is more attractive in OLED is to shed clear light on the new design products, such as flexible and rollable panels, transparent panels. These fascinating features of OLEDs open a whole new world of artificial lighting. OLEDs are light-emitting diodes in which the active materials consist entirely of organic semiconductors. In contrast to inorganic LEDs, OLEDs are area-light source, and could be flexible when flexible substrates, such as plastic films, are used. (Fig. 1 a). Furthermore, OLEDs can be fabricated by rather simple techniques such as vacuum evaporation method, not requiring toxic gases etc. Ultimate methods of thin film formation of organic semiconductors are printing techniques such as inkjet printing and gravure printing techniques, enabling roll-to-roll process which is extremely fast and low cost manufacturing process. 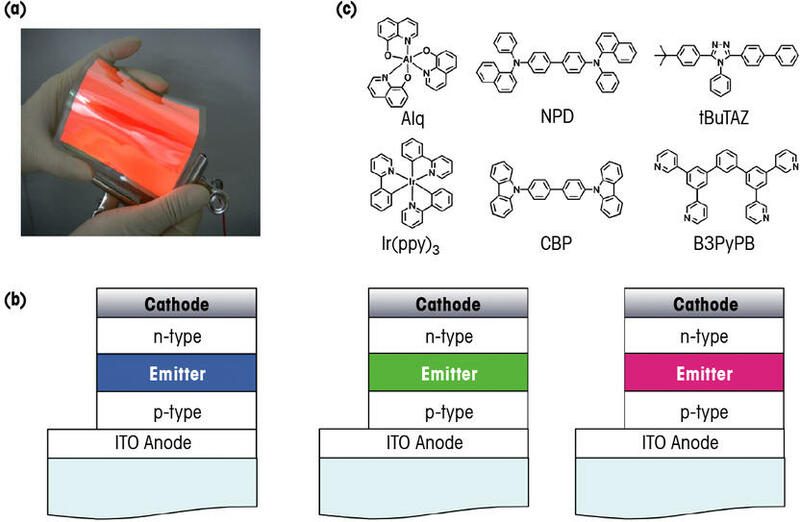 Typically, OLEDs consist of plural of ultra-thin organic layers around 100–200 nm in total thickness where organic emissive layers are sandwiched between p-type and n-type organic semiconductor layers (Fig. 1 b). These organic semiconductors are kinds of aromatic compounds those have π-electron systems (Fig. 1 c). These π-electrons play very important roles, depending on the chemical structure of materials, to carry holes and electrons through organic layers, which results in the hole-electron recombination to give off the light emission from organic semiconductors. Fig. 1 (a) Photograph of flexible OLED panels. (b) Device structures of OLED. (c) OLED materials. OLED research is very unique in a sense that a number of researchers and knowledge from different scientific fields are involved. 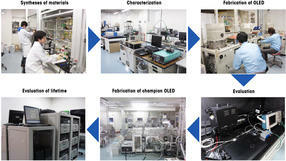 Figure 2 shows typical R&D process to create novel organic semiconductors and high-performance OLEDs in our laboratory. In order to develop novel organic semiconductors, organic chemists are needed to design and synthesize new molecules. Before synthesizing materials, quantum chemical calculation is used to select promising materials. 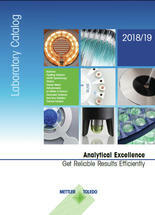 This selection process is critically important because it sometimes takes several months to synthesize a new material. When the target materials can be obtained successfully, purification and characterization are carried out. Then, preliminary devices are fabricated to evaluate the performances of the materials. When superior OLED performances are obtained, careful optimization of the device structure and evaluation of the device lifetime are performed. As such, collaboration of researchers from different scientific fields, such as quantum chemistry, organic chemistry, material chemistry, photophysics, semiconductor physics, is necessary. Because researchers in each fields has their own language, communication can become one of the biggest hurdles to promote OLED research. So, a researcher who knows both chemistry and physics can play a key role to facilitate this type of collaboration. Fig. 2 R&D of high-performance OLED materials and devices in our laboratory. Approximately 20 % of total global electricity is consumed by general lighting such as incandescent bulbs and fluorescent lamps. A standard fluorescent lamp turns electrical power into light more efficiently than incandescent bulbs, exhibiting a power efficiency of 70 lm W−1. However, the standard fluorescent tube contains highly toxic mercury and does not meet the requirements of the EU WEEE & RoHS directives. The sustainable society of the future must have an artificial source of general lighting that is environmentally friendly and has power efficiency beyond that of the fluorescent lamp. Thus, OLEDs are expected to become one of the next-generation general lighting devices because they are more efficient than fluorescent lamps and are mercury free. For general lighting application, the light source requires the brightness of 3,000 – 5,000 cd m–2, and a standard fluorescent lamp achieves 70 lm W–1 and 10.000 hours lifetime. Thus, the next generation light source should achieve higher power efficiency and a longer lifetime simultaneously at high brightness. High color rendering index (CRI, Ra >80) should also be required to reproduce the colors of an object being a human eye friendly light source. For OLEDs, we can use the various emissive organic materials with different colors to produce a white emission with a high Ra and a desired correlated color temperature (CCT). From the power consumption point of view, a large part of energy supply in conventional light sources is converted into heat instead of light. For examples, the surface of incandescent bulb reaches ca. 90 ˚C and that of fluorescent lamp reaches ca. 60 ˚C. Therefore, it is essential for the next-generation light source to keep cool at the surface by realizing high power conversion efficiency. In this regard, OLEDs are an ideal light source and able to keep the surface temperature at room temperature level. What is more attractive in OLED is flexibility in design. OLED panels can be very thin, less than 1 mm, and flexible depending on the substrate material. Transparent OLED panels can be made when transparent electrodes are used for both anode and cathode. These fascinating features enable lighting designers to create a whole new world of lighting (Fig. 3). In 2013, researchers at Panasonic introduced white OLED panels with 110 lm W–1 efficiency at a luminance of 1,000 cd m–2. They also realized tandem white OLEDs with an extremely long lifetime of over 100,000 hours at 1,000 cd m–2 . Fig. 3 Demonstration of OLED lighting by Lumiotec, JPN (Milano Salone, April, 2012). At this stage, the efficiency of white OLED panel has just reached to 110 lm W–1 at 1,000 cd m–2 beyond the performances of fluorescent tube, and there is still much room to improve the power efficiency compared to the theoretical limit of 248 lm W–1 . The power consumption is directly proportional to the operating voltage, therefore, the operating voltage must be minimized by using a smart material and device engineering. Simultaneously, it is absolutely essential to realize high internal quantum efficiency. For this, development of highly efficient emitting materials, so-called phosphorescent materials and thermally activated delayed fluorescent (TADF) materials  to use all the generated molecular excitons, i.e. 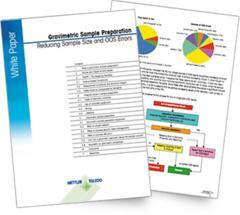 75 % of triplets and 25 % singlets by electrical excitation, are required. In this regard, what is requested to material chemists is to clear the relationships among chemical structure, quantum chemical simulation, physical properties and device performances. This would contribute greatly to extract a guideline to maximize the potential of a material and device performance. Fig. 4 OLED communication wall system and lighting. 3,000 cd m–2. For the future green technology, printable OLED is developing very rapidly and approaching the efficiency in the evaporated system. We believe that wall paper-like OLED displays are used as “communication wall system” and OLED lighting panels will replace traditional light sources in the near future (Fig. 4). First publication: Sasabe, H., Kido, J., q&more, 1.2014.